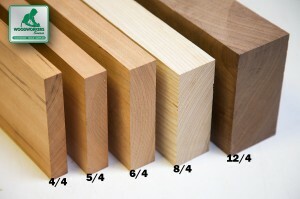 Soft Maple lumber comes in random widths and lengths, with a uniform thickness. 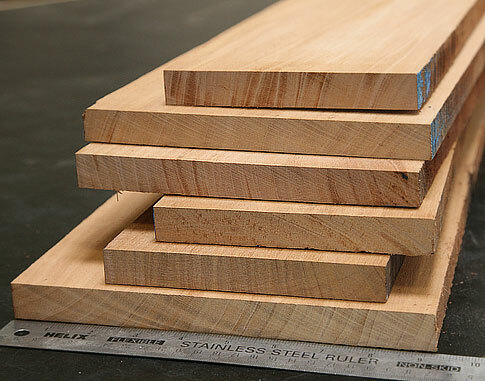 Okay, so you want a nice wood with a tight grain and closed pores, preferably consistent light color? Soft maple is a little bit different from its cousin, hard maple. The most significantly is that soft maple accepts stains and dyes much better. I asked for straight grain lumber for table legs and the guys could not have selected better wood. Came well packaged and had no damage. Thank you! Review by iceflatline from U.S. Purchased 8 Bd. 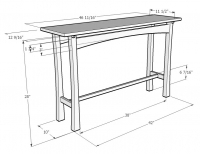 Ft. of this to make a Moxon vice. Quality of wood exceeded my expectation. Arrived quickly. No warping - nice and straight. Good grain. Vice turned out great. Their prices are way too expensive compared to other hardwood dealers. I found another local hardwood dealer who charges $3.60/bf for 8/4 soft maple. Even as a rosewood club member or buying more then 100 bf you can save hundreds of dollars buying else were. Their 12/4 cherry and walnut is TWICE as expensive as other dealers. I like Woodworkers Source, but I can't continue to throw money away. I'm a Local guy who has bought 90% of my lumber from WWS. I bought some soft maple recently and when I got the board home I discovered the board was twisted terribly. I ended up cutting it up to use for some smaller items. I partially blame my self for not paying closer attention in the store. The issue I have is this board was milled up already and it was refused by someone else. (maybe the guy who posted the review before me?) They put it back in the rack for some other shlup to pick. I should have paid more attention. Bad on me. So I figured I would try some place else and discovered pricing elsewhere was only 3.70 a BF for 8/4 Soft Maple and that price is normal without having to be part of the rosewood club. Now I feel that I am being taken advantage of. Come on guys.... Your charging 2 dollars a BF more for domestics and to boot your keeping terrible pieces on the racks. I'm not to happy with you at the moment. Sorry guys, between the twisted board and the price difference you'll probably see allot less of me in the store. If your price was more competetive I would return.